The Colleges of Science, Agriculture, Engineering, Liberal Arts, Technology and Honors hosted the Undergraduate Research and Poster Symposium on April 12. The symposium seeks to raise awareness about undergraduate research programs at Purdue. It is open to any undergraduate student currently conducting research. Students are encouraged to showcase their progress in research fields even if your research findings are not quite complete. 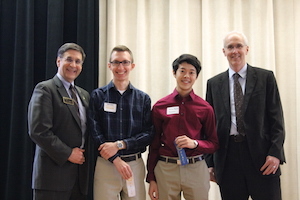 The College of Science winners were sophomore Kenny Nguyen (Neurobiology and Physiology), senior Jessica Cleveland (Biology) and senior Bryan Rainey (Computer Science), who placed first, second and third, respectively. Winning the Honors College People’s Choice awards from the College of Science were Neurobiology senior YiYi Gann and Chemisry junior Jade Keane. Biology junior Devang Thanki took home the Libraries Abstract Award for the College of Science as well. The 2016 Undergraduate Research and Poster Symposium is slated for April 2017.